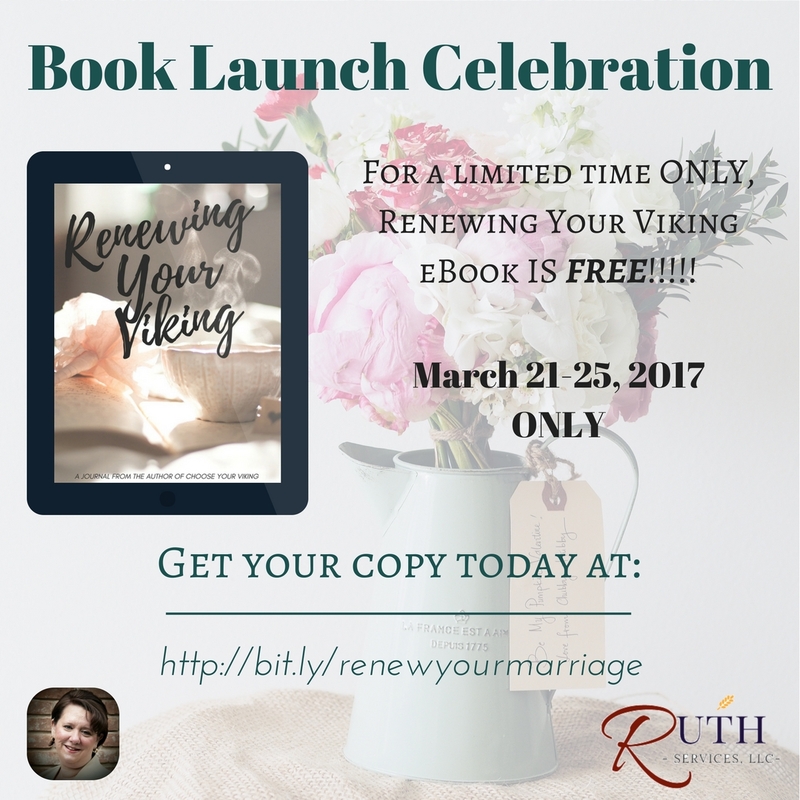 I am pleased to announce that the eBook version of Renewing Your Viking is FREE for a limited time only!! I cannot wait to read your reviews! After you’ve read the eBook for free, consider picking up a couple of print copies for your friends and family. It never hurts to work on your marriage. These past few weeks, I’ve been working on a little journal for married women. The journal is presenting some technical issues prior to release but I’m so excited about it that I’m determined to work through those technical issues to get this journal released asap. Why? What is in this little journal that makes me so excited? Nearly every week, I meet a woman who wishes she had married a Viking instead of the prince charming she thought she married. I try to sit with each one of these women I meet and go through a process I’ve developed to help them find their love again but, so often, I just don’t get the option to walk them through this process completely. In addition, I’ve learned that, while the process helps, they need to put the concepts into action in order for them to get the full effect. 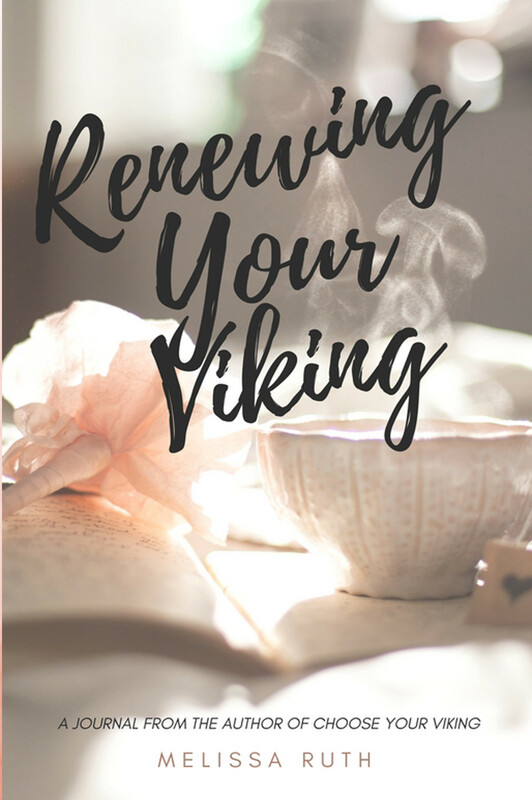 Renewing Your Viking is a small journal which allows them to do just that…I’m so excited! 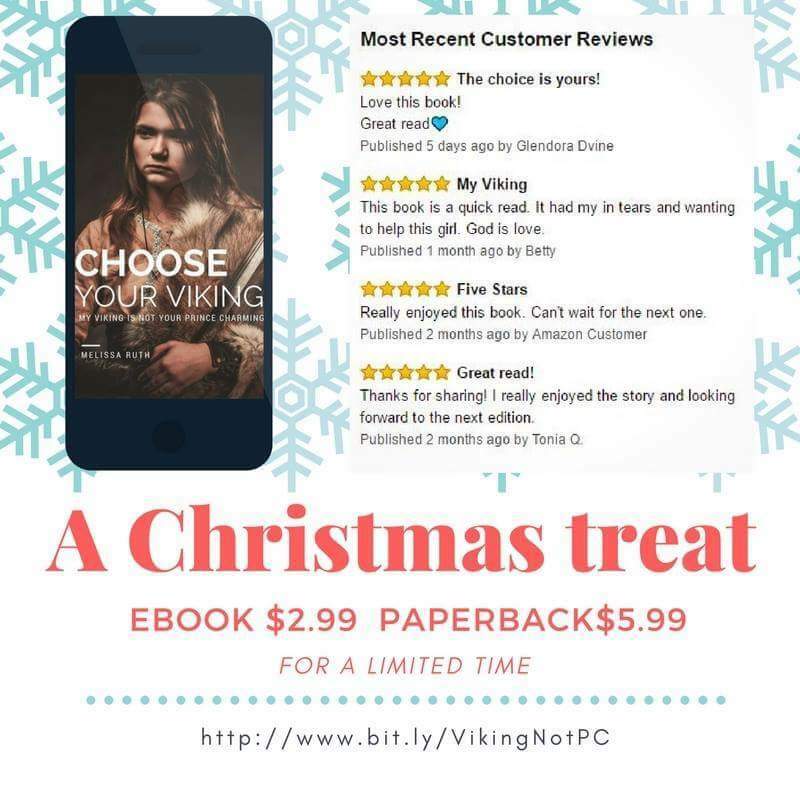 Recently, I had the opportunity to share more about Choose Your Viking and the concepts in it via a few media sources. I am beyond honored to be asked to join these amazing media outlets to share about my book and future plans. If you have visited here due to hearing me on one of those media sources, welcome! If money was not a barrier, I’d travel to every part of the world, sitting down with each of you to encourage and inspire you to see the world as an open book waiting for you to fill the pages. If time was not a barrier, I’d walk with you on your journey as your own personal cheerleader, cheering you on every step of the way. I’d help you see the positive of the battle you are facing currently. I’d help you to see you can get past this horrible tragedy. I’d walk with you day by day, framing your experiences of the day in a positive light. If physics was not a barrier, I’d sit on your shoulder whispering God’s promises in your ear so you would never forget how much He loves you even when it feels like life is out to get you. However, the truth is money, time and physics are all barriers to my desires. This, however, doesn’t stop me from trying. It is largely why I wrote Choose Your Viking and why I continue to write my books. You see I cannot physically meet each of you or sit on your shoulder or spend personal time coaching each of you but I can write my books, put them out there and share them with you. It is also why I am honored to be part of the Author in Business Book Tour and am begging you to come. It isn’t often that you can actually have personal time with authors who write their books. This is an exclusive moment for you to listen to, speak with and be inspired by some amazing authors who feel the same way I do. They want to invest in you! So, what are you waiting for? 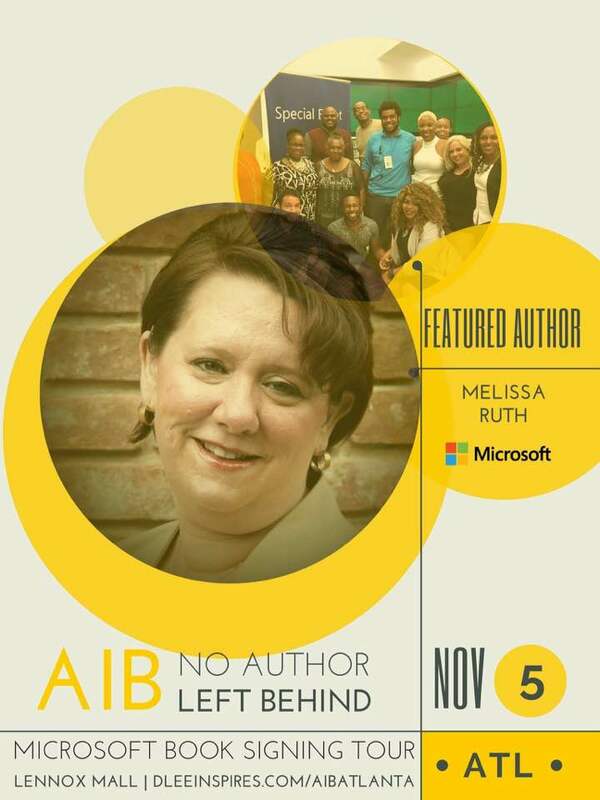 Register today for the AIB book tour! It’s tomorrow, January 14th at 3pm to the Microsoft store in the Houston Galleria mall. Register at http://bit.ly/aibhouston. Space is limited to be sure to register immediately. If you aren’t available but know people nearby, please feel free to share. While you’re at it, let me know you are coming! I want to be watching for you! Post on my Facebook page, send me a tweet or Instagram comment! Choose Your Viking and the series, “My Viking Is Not Your Prince Charming” has a dream. It’s dream? To ignite the people of today to be who they were called to be. To stop waiting for life to show them what they are supposed to do, to stop waiting for the door to open and the red carpet to be rolled out, to grab hold of their destiny and start investing in their world. You see, too often, we are taught to fit into a mold. Yet, we do not realize that that mold is not for everyone. Life is not just about going to school and getting a degree so you can make a living. You are here on this earth for a purpose…to love others, to invest in others, to invent something that changes the world or to share a story that changes the lives of others. Whatever your purpose, stop waiting for someone to show you the way and take the first step. Don’t let your past define you. Don’t let the unknown stop you. Don’t let the world tell you why you are here. Only you and God can determine that together (p.s. He already knows). Has he told you what your first step is? Is there a dream within your heart you know you must fulfill? What is the first step to fulfilling that dream? What must you do today that cannot wait? I know it is there. You just have to look for it. You were born for more than this. You are invited to my first ever book signing! You’re invited to celebrate with us during the 1st Largest Group Book Signing Ever! Shocking the self-publishing market with a new innovative way to make an impact and change lives! With the opportunity to meet AIB Amazon Best Selling Authors, enjoy light refreshments, hear from them directly on how they chose to impact others with their books. You don’t want to miss this Never Seen Before Event!